For East­er this year, we went to my par­ents’ house. They spent most of their win­ter down south, and Kael and Asa were both very anx­ious to vis­it them. They want­ed to get their share of grand­par­ent time in addi­tion to check­ing out their toy stash for any new arrivals or old favorites. Some time in the semi-dis­tant past, I was in a place where I was able to vis­it my par­ents pret­ty fre­quent­ly. I can’t remem­ber how often we vis­it­ed when we had only Kael, but I know that there were times dur­ing col­lege when we vis­it­ed at least every two months. Oh, how things change. We start­ed out for my par­ents’ house on Fri­day morn­ing. Before we even drove six blocks, we had to stop. One of the old­er boys dropped a book. Not a prob­lem, right? We can make a quick stop and keep going. Before we were out of town, we stopped again. This time it was some­thing else that was a pret­ty easy fix. We kept going. Our third stop hap­pened about 90 miles from town. We stopped for lunch. Luck­i­ly, after lunch every­one seemed pret­ty con­tent, and we were able to get a decent chunk of dri­ving in. After about 45 min­utes Jason said he had to go to the bath­room. I said what every good teacher mom says. “Are you sure? Is it an emer­gency?” I urged him (very strong­ly!) to wait. He gave me a look, but he did. We drove anoth­er hour and at that point when he start­ed to pull into a gas sta­tion in a small town, I knew bet­ter than to argue with him. As we got back on the road, we real­ized that we had for­got­ten baby food for Jonas. Luck­i­ly, there was a town with a large gro­cery store just 10 min­utes down the road. Yep. Stop #5. I ran in with Kael. We got some baby food and gum and got back on the road. We had about 70 miles left. Sure enough, about 30 miles into the last leg of our trip, Jonas was tired of being in his seat. Jason moved into the back seat next to him, and I took over dri­ving duties. We made it through the final 40 miles with­out a stop. That’s an aver­age of 47 miles in between stops and one stop every 63 min­utes. Of course we had a great time at my par­ents. We relaxed. We were very well fed. We saw fam­i­ly. We had very lov­ing, car­ing, com­pe­tent babysit­ters while we enjoyed a sup­per by our­selves. We slept. We watched the Food Net­work. It was great. This morn­ing, though, the time came to return home. I was hop­ing for a trip that was easy and stress free as the trip out had been. After dis­sect­ing the trip, it sounds a lot longer, chop­pi­er, and drawn out than it felt. I had a book to read on the way out, and most of our stops were quick and easy. So, even though we did stop 6 times, it wasn’t quite as bad as it sounds. We packed all our stuff, and we got in the van. We were on the road at almost the same time as we had left home on Fri­day. Sure enough. Just as we were get­ting going, Kael said, “I’m super cold. I need some­thing that can keep my arms warm.” So, we stopped and got him a sweat­shirt (after I turned up the heat and let it go a few min­utes). A few min­utes lat­er, the boys were fight­ing over books. Who had how many, who had which ones, etc., etc. Then, one of the books fell on the floor. So, we stopped to get it, and we got the grapes out at the same time (I think. I may be con­fus­ing stops though.) We drove for a while, and then we heard, “Dad, I have to go pot­ty!” So, we stopped and used the con­ve­nient ditch pot­ty avail­able next to a flood­ed road. For those keep­ing track, that’s 3 stops in about 30 miles. We man­aged to make the next 40 miles with­out a stop, but then it was lunch time, so you guessed it. Stop #4. We ate lunch, and we got back in the van. After we ate, Jonas didn’t want to have any milk, and he wasn’t ready to go back to sleep. Not great. He start­ed to fuss. Jason reached into the back­seat, and he gave Jonas a few new toys to play with. That didn’t seem to be what he need­ed. So, he popped Jonas’s paci­fi­er in. That wasn’t it either. So, we stopped. Jason hopped into the back­seat. I drove. As we drove, Jonas was get­ting more and more sad. At one point, I remem­bered that I had a bag of expressed milk in a cool­er bag in the back of the van. After lis­ten­ing to my baby who nev­er cries cry for so long, I stopped. I grabbed the milk, and I start­ed warm­ing it up on the dash of the van. Now, nor­mal­ly I would not use direct sun­light to warm expressed milk, but trust me, this wasn’t a nor­mal sit­u­a­tion! It was get­ting a bit warmer, but as it slow­ly warmed up, Jonas was get­ting angri­er and angri­er. I grabbed my mug of cof­fee and took a drink. Then, I real­ized that both Jason and I had ther­mos mugs of warm/hot cof­fee. When we are at home, we use warm water to reheat breast­milk. I fig­ured that in a pinch this cof­fee could be a sub­sti­tute. So, Jason stuck the bag of milk into his ther­mos and warmed the milk. Appar­ent­ly it did the trick. He was able to get the milk into the bot­tle and feed Jonas as we drove. Then, we drove. And we drove. And we drove. We drove some­where around 150 or 160 miles with­out stop­ping! As we were get­ting clos­er and clos­er to home, I start­ed ask­ing as we approached each town, “Every­one okay? Any­one need any­thing?” I knew that if we need­ed to make a bath­room stop, I wouldn’t be able to stretch it for just a few more min­utes after the boys had wait­ed over two hours. They kept answer­ing the same, “No.” “I’m okay.” “Nope.” Until we were about 12 miles from home. As we were approach­ing our last chance bath­room stop, Jason asked if they need­ed to stop, and they both answered, “I do!” So, we made our final stop. 12 miles from home. We then arrived home to unload all our stuff in a quick rain show­er. That’s an aver­age of one stop every 40 miles and about every 49 min­utes. When Super Grover los­es his super­ness, Sesame Street needs a hero! Nev­er fear, Elmo and his team of Healthy Heroes are here. Teach­ing lessons of healthy habits through song and dance, Elmo, Abby Cad­ab­by and your favorite Sesame Street friends will explore exer­cise, nutri­tion, sleep/energy and hygiene – all in a quest to put the “super” back in Super Grover. It’s Elmo’s Healthy Heroes to the res­cue! It wasn’t my first choice of places to be in the mid­dle of the after­noon on New Year’s Eve, but I did it for the kids, right? The show itself was fine. All the “big” char­ac­ters were there. We had good seats so we were able to see the char­ac­ters well, and at times they came down off the stage and dances in the aisles. Asa like that. Kael didn’t. The gist of the show is that Grover doesn’t take care of him­self, so he isn’t “super” any­more. This of course isn’t revealed until the end. How­ev­er, while Grover is look­ing for his super-ness, his friends help solve prob­lems through singing songs about exer­cise, nutri­tion, hygiene, and get­ting enough sleep. After about 45 min­utes, the char­ac­ters left the stage and the lights came on. There was an announce­ment that there would be a 15 minute inter­mis­sion. After all the talk about tak­ing care of our­selves, health, nutri­tion, and mak­ing good choic­es imag­ine my sur­prise when dur­ing the inter­mis­sion, a Sesame Street cart with snow cones and cot­ton can­dy turns on its lights. Yes, that’s right. The only two items that Sesame Street had to offer kids and their fam­i­lies to eat at Elmo’s Healthy Heroes were snow cones and cot­ton can­dy. 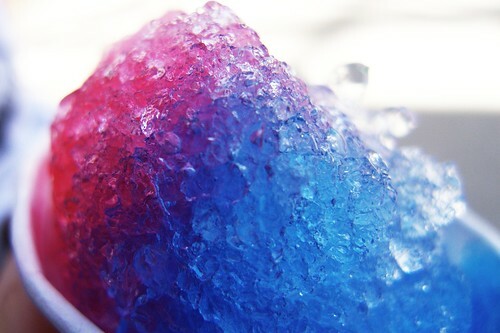 Nei­ther cot­ton can­dy nor snow cones have any real ingre­di­ents! They are made up of sug­ar, arti­fi­cial col­ors, and chem­i­cals. That’s the food that Sesame Street chose to sell the chil­dren who came to see Elmo’s Healthy Heroes. There were no almonds, no pop­corn, no car­rots, heck, they didn’t even have cook­ies! Cook­ies at least have FOOD in them! No, the peo­ple behind Elmo’s Healthy Heroes chose to sell chil­dren snacks with no food in them oth­er than sug­ar! I point­ed this incon­sis­ten­cy out to my hus­band at the per­for­mance, and all he did was shake his head. He was also in dis­be­lief. It seemed to me like a per­fect exam­ple of the dif­fer­ence between aware­ness and action. It seems like every day, we’re hear­ing about some sort of aware­ness cam­paign. Buy­ing pink prod­ucts, post­ing bra col­ors, par­tic­i­pat­ing in a day of social media silence, chang­ing pic­tures on Face­book to car­toons, etc., etc., etc. If you want­ed to, you could par­tic­i­pate in an aware­ness cam­paign every day of the week. But, what are we doing with this aware­ness? Seem­ing­ly, noth­ing. How many peo­ple out there don’t know that breast can­cer exists? Great. Breast can­cer. Now, you’re aware, too. What about action? What about doing some­thing? We all know that there are peo­ple out there who expe­ri­ence can­cer, home­less­ness, hunger, obe­si­ty, abuse. In my opin­ion, this is exact­ly what hap­pened at Elmo’s Healthy Heroes. They gave great lip ser­vice to being healthy and mak­ing good choic­es. Kids heard the mes­sage. Then, they missed their chance to take action. Instead of offer­ing fun, healthy foods, they went with some­thing that was non-per­ish­able, cheap, chem­i­cal­ly based, and nutri­tion­al­ly worth­less. I wrote an email to Sesame Street express­ing my frus­tra­tion. As expect­ed, I haven’t received a reply. **As a side note, my chil­dren do not eat a per­fect diet. They eat sug­ar. They eat arti­fi­cial col­ors and chem­i­cals in some of their foods. They have eat­en cot­ton can­dy before. How­ev­er, I did not expect to encounter this type of food as the only food being offered at an event sup­pos­ed­ly ded­i­cat­ed to healthy liv­ing and mak­ing good choic­es regard­ing food and self-care.